If the records are powerful, they only hint at the unfettered force of Atzmon in the flesh. But raw emotion is always mitigated by tenderness, by his gift for melody and an awareness of light and shade. 'Burning Bush', a statement of raw anger, is thrown into relief by the interruption of a plaintive 'Nature Boy'. The decidedly non-metropolitan 'Scarborough' was approached from an oblique angle - Atzmon placed the bell of his horn in the interior of the piano, and produced serpentine coils from which the simple beauty of 'Scarborough Fair' emerged. The pace accelerated and the beloved folk song was subjected to a modal work-out, à la 'My Favourite Things'. The closest he came to orthodox jazz was an elegant 'Autumn in New York' (maintaining the geographic theme), which managed the trick of being virtuoso, lyrical and straightahead all at once. 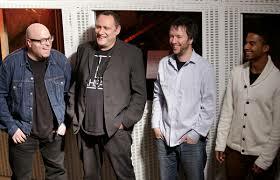 Actually all the guys in the band disconnected, and were only reluctantly dragged into proceedings when Atzmon summoned them by name. This, I hasten to add, only during Atzmon's sardonically comic introductions. Musically, they were splendid. The youthful Eddie Hick, plucked from Leeds College of Music with the tough task of following Asaf Sirkis, confidently functioned at the twin extremes of finesse and aggression. Yaron Stavi is a bassist who plays in tune (a basic requirement, but harder to fulfil than might be expected), centres the beat with stable precision and adds depth when wielding a bow. Best of all was pianist Frank Harrison. Atzmon and Harrison reaffirmed demonstrated their affinity by recently touring as a duo, and twice the other musicians dropped out for piano and horn to push the music into fresh realms of harmonious abstraction. And the book? The Wandering Who? is subtitled 'A Study of Jewish Identity Politics' and it's intellectual bona fides are endorsed by James Petras and Karl Sabbagh on the back cover. The suspicion lingers however, that the last word on Jewish identity in politics and culture might have been provided by Atzmon's rendering of 'Nature Boy' earlier in the evening.